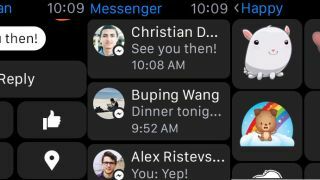 Facebook's dedicated Messenger app, announced at the keynote in September, has now come to the Apple Watch. However, it doesn't work exactly as it does on the phone. The screen on the Apple Watch isn't particularly large so you can't type out full messages – instead the app comes with the ability to send voice clips, Likes, emojis, stickers, and dictate messages. All those Power Rangers and Pusheen stickers are set to become even more useful when using your Apple Watch. However, you can't start a new conversation from the Watch, which is a bit of a shame. To get the update you'll need to be running the watchOS 2 software, so make sure you've updated the Watch software before the app itself.